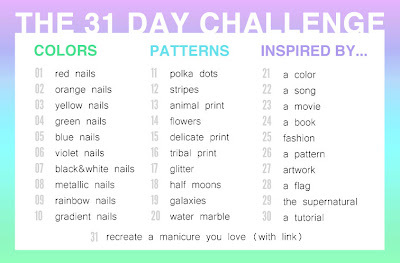 Ashley is PolishAddicted: 31 Day Challenge Day Nine - Rainbow Nails! 31 Day Challenge Day Nine - Rainbow Nails! Happy Saturday! Welcome to Day 9 of the 31 Day Challenge - Rainbow Nails. I think today's post fits the word "happy" perfectly! I decided to do a rainbow of dots. I started out with a base of Milani White on the Spot, then took my dotting tool and used (from top to bottom) Barry M Indigo, Zoya Mira, Revlon Sassy, Zoya Arizona and Zoya Shelby. Pretty simple (and definitely not perfect) but fun. 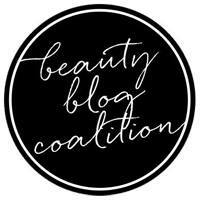 Don't forget to check out the other awesome bloggers participating in the challenge below! 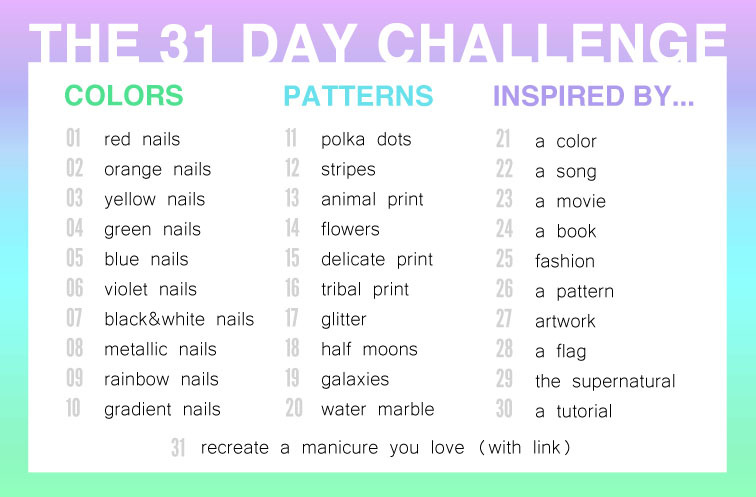 If you'd like to join the 30/31 Day Challenge, go here to grab the codes to embed in your posts for the next 30 days and add your post using the link below! I love this design - well done! This is FANTASTIC! Such a HAPPY mani. BB Couture Dragon's Breath Giveaway! 31 Day Challenge Day 18 - Half Moons! 31 Day Challenge Day Fifteen - Delicate Print! 31 Day Challenge Day Fourteen - Flowers! 31 Day Challenge Day Thirteen - Animal Print! 31 Day Challenge Day Twelve - Stripes! 31 Day Challenge Day Eleven - Polka Dots! 31 Day Challenge Day Ten - Gradient Nails!